cans, overwhelmed with an array of potential options. Anyway, on this occasion I broke down and decided to give Pelican Brewing a second chance. The first time I encountered one of their brews I was put in the unfortunate position of considering taking the empty bottle back to the store and asking for my money back. Seriously. Didn't like it, not even a little bit. Somehow I thought this time would be different. I suppose it was, just a little. It wasn't offensive, it wasn't terrible. At the same time I wouldn't rate it as good. To be perfectly blunt, I recently had some Coors Banquet Beer, and given a choice I'd take the Coors over the Kiwanda. As a side note, I'm still quite surprised. The Coors was pretty damn enjoyable, but that's a subject for another day. The Pelican brew is actually very similar to the Coors. It's an almost completely nondescript beer. If it wasn't for that "almost" I'd probably recommend it, but it's the "almost" that is it's downfall. One might consider this slightly above an American Lager like a Miller or a Bud simply because it lacks the skunky hoppiness and corn aftertaste that you tend to get with those, but the Pelican cream ale has it's own off flavor aftertaste. In fact the aftertaste is more substantial than the beer itself. The best I can really describe it (and you should keep in mind I'm drinking it out of a glass bottle) is toasted rice and aluminum. The toasted rice part doesn't seem quite right, but that's the best I can come up with. Yeah, I've had worse. No, I'm not on the verge of demanding my money back. 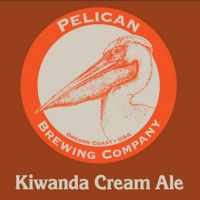 Will I try a Pelican brew again? Probably not. 2 out of 2 disappointments. I've got better things to spend my pennies on.